When a tooth suffers an area of decay or damage, it must be repaired. Unless the repair is large enough to require a crown or onlay, the tooth can be restored in one of two ways: amalgam fillings or composite resin fillings. Amalgam fillings have been around since 1895 and include a combination of metals. Composite fillings, however, are a newer option in dental fillings. Composite is a ceramic and plastic compound that matches the color of your teeth. Many patients find that these tooth-colored or white fillings are a preferred solution in repairing cavities or even making minor cosmetic improvements to the teeth. In fact, it is not uncommon for patients to want their amalgam fillings replaced with this composite resin alternative. #1 You want your filling to blend in, not stand out. The hallmark advantage of choosing composite resin is aesthetics. Instead of flashing a metal filling when you laugh or speak, you can opt for a tooth-colored filling that provides a seamless and inconspicuous blend within your natural smile. #2 You don’t want metals or mercury in your mouth. While it is still a large debate among dentists, there are a large majority of patients that simply want to avoid the potential dangers of having metal in their mouths. Amalgam fillings are made of 50% mercury. Mercury vapor can release or leak out from amalgam fillings, and many people are concerned about the toxicity of this element within the body. Furthermore, silver fillings may not be a good choice if you have an allergy to metal. #3 You want to preserve as much healthy tooth structure as possible. Unlike amalgam fillings, composite resin is very flexible and bonds directly to the surface of your tooth. This means that less drilling is required and more of your healthy tooth structure can be preserved. Want to learn more about white fillings offered at Pure Dental Health? Please schedule your appointment. We value the importance of providing patient-preferred options when repairing tooth damage. Could A Night Guard Be the Solution to Your Migraines? Do you catch yourself clenching your teeth during the day? Have others told you that your grind your teeth while you sleep? This is called bruxism, and it may be the reason you are suffering from daily headaches or migraines. Clenching and grinding puts hundreds of pounds of pressure on tooth surfaces. Typically, chewing exerts 20 to 40 pounds on the teeth, but the pressure from grinding can be 250 pounds, according to an article in the Chicago Tribune. This excessive pressure doesn’t occur without consequences. Not only can bruxism lead to worn out teeth and TMJ discomfort, but the tension is also a leading cause for headaches. Your teeth are connected to your jaw, and your jaw is connected to your skull. If your clenching and grinding occurs over a significant period of time (such as all night), the pressure and pain can spread beyond your teeth and jaw joint to include your ears, neck and head. The presence of tension headaches and daily migraines can be a real threat to your quality of life. If you’ve tried other headache remedies and failed to find relief, it may be time to look to your dentist for answers. At Pure Dental Health, we are proud to offer one of the most proven systems for bruxism-related headaches. Our practice uses an FDA approved therapy called the NTI night guard system. 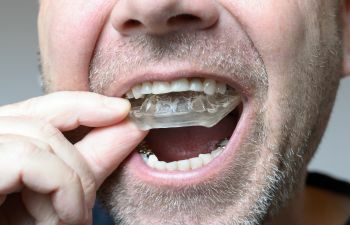 The NTI night guard is much smaller than a typical night guard, which reduces the common concern that it will be uncomfortable to wear through the night. In addition to migraines, the NTI guard also helps with TMJ disorders, muscle pain, ear aches and muscle spasms. To learn more about addressing your headaches with the NTI night guard system, call Pure Dental Health today! 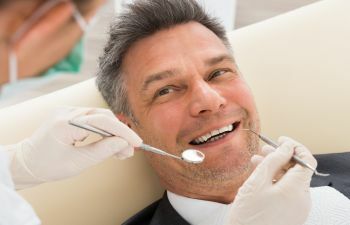 If you have a fear of the dentist or have ever had to have a lengthy dental procedure, you may already be familiar with the term sedation dentistry. 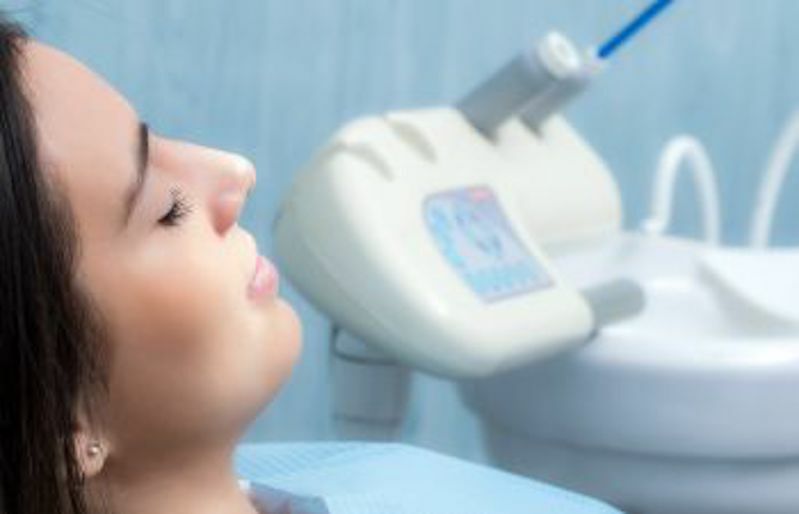 Sedation dentistry is used to help patients relax in the dental chair. There are many forms of sedation dentistry, however, and not every dentist is equipped to offer them all. IV moderate sedation involves administering a sedative through your veins (or intravenously). This allows it to work quickly, and it also gives the dentist an easy way to adjust the level of sedation during treatment. Does IV sedation put you to sleep? This method of sedation does not put a patient to sleep. Instead, patients remain in a semi-awake state, or a “twilight sleep.” In most cases, you’ll have little to no memory of the procedure if you receive IV sedation. IV sedation may be recommended in a variety of circumstances. It can be needed for patients that are severely anxious or fearful of the dentist and need more than nitrous oxide (laughing gas) to help them relax. IV sedation is most commonly used for patients who are undergoing a more complex or lengthy dental procedure, such as dental implants, extraction or a full mouth reconstruction. 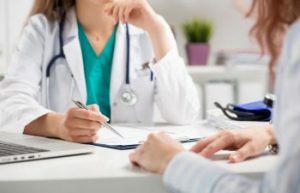 How is IV Conscious Sedation different than General Anesthesia? It is important that patients understand the difference between general anesthesia and IV conscious sedation. While both may be administered through an IV, you will remain awake during IV conscious sedation but in a deep sleep with general anesthesia. In fact, patients cannot be aroused while under general anesthesia and will need support for breathing and vital sign monitoring. IV conscious sedation allows patients to avoid discomfort, but remain in a safer “semi-awake state.” This is often all that is needed to reduce anxiety and provide a relaxing dental treatment. While under IV sedation, you can even respond to a verbal command or light physical touch and will not need oxygen or other breathing support. 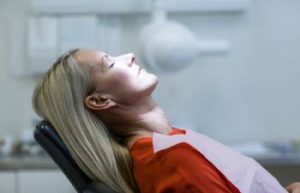 While most dentists now offer minimal or moderate sedation, such as nitrous oxide or oral sedation, only an elite percentage of dentists are qualified to administer more complex sedation techniques such as IV conscious sedation. At Pure Dental Health, we are proud to have a licensed IV sedation dentist on staff to ensure all patients have a comfortable and pleasant experience in the dental chair. Most patients feel surprisingly very good after having IV sedation. For your safety, however, we ask that you arrange for a friend or family member to drive you home. You will not remember your procedure but should easily return to an awake/alert state of mind. Have more questions about IV sedation from your dentist? We’d love to answer them. It can be a remarkable solution that enables patients to get the dental treatments they need and deserve. Nearly 23% of the American population has no dental insurance coverage, according to a recent article in USA Today. Are you avoiding dental care because you lack dental insurance? In many cases, people without dental coverage wait for something to go wrong before they see a dentist. This is can be a costly and very unfortunate mistake because routine dental care (such as professional cleanings, x-rays and exams) can prevent a host of disruptive dental problems for all ages. Whether you can’t afford coverage or don’t see the benefit, this shouldn’t be a reason to cancel your dental appointments altogether. In fact, many offices such as Pure Dental Health, offer special financial plans to help those without traditional dental insurance. There’s no denying the fact that paying out of pocket for your dental care can be pricey, especially if you need a specific restorative procedure such as a root canal, dental implant or crown. The goal is to avoid these treatments in the first place, which undoubtedly begins with seeing a dentist twice a year. Dental care is not something you should avoid due to cost. 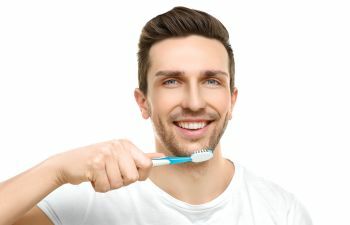 Your oral health plays a critical role in your overall health and neglecting dental problems can lead to very serious (and costly) issues within your smile. Attaining a healthy and confident smile can be financially feasible by taking advantage of one of our payment plan options. As an added bonus, many of our financing services can be utilized for cosmetic dentistry – a dental specialty that is rarely covered under dental insurance but one that is just as valued towards your smile confidence and self-esteem. To learn which payment plan fits your family budget best, please call Pure Dental Health. Don’t let a lack of dental insurance keep you away from a rewarding experience at the dentist!